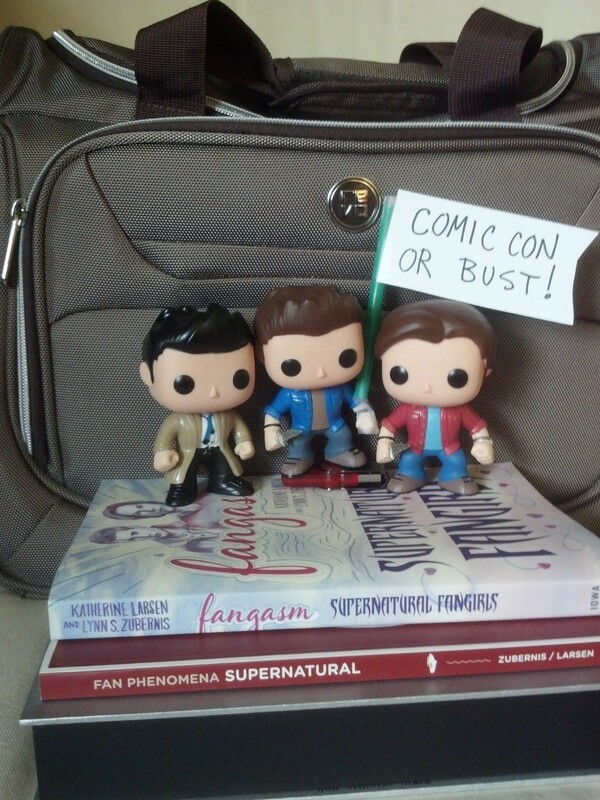 Fangasm Comes to Comic Con – With Supernatural Giveaways! We’re so excited to be returning to Comic Con this year – and this time, we’re bringing our books! Our adventures at Comic Con are part of the story of Fangasm: Supernatural Fangirls, from the endless hours of waiting in line, the meticulous scheming and the mad dash to get into the hall one year, to feeling like the luckiest fangirls in the world the next, behind the scenes at the WB booth with Eric Kripke, Sera Gamble (and surprise Jensen Ackles). So it’s especially fitting that we’ll be bringing Fangasm to Comic Con, along with Cinequest. Come by and pick up your copy! And that’s not all! We’re welcoming Supernatural back to Comic Con (is it really for the tenth time??) with the book launch for our new book, Fan Phenomena: Supernatural! This will be our first time offering Fan Phenomena for sale at a venue instead of online, and we’re ridiculously excited about it. Stop by the Cinequest booth on the Comic Con floor and join our celebration! And what’s a celebration without some free Supernatural swag?! 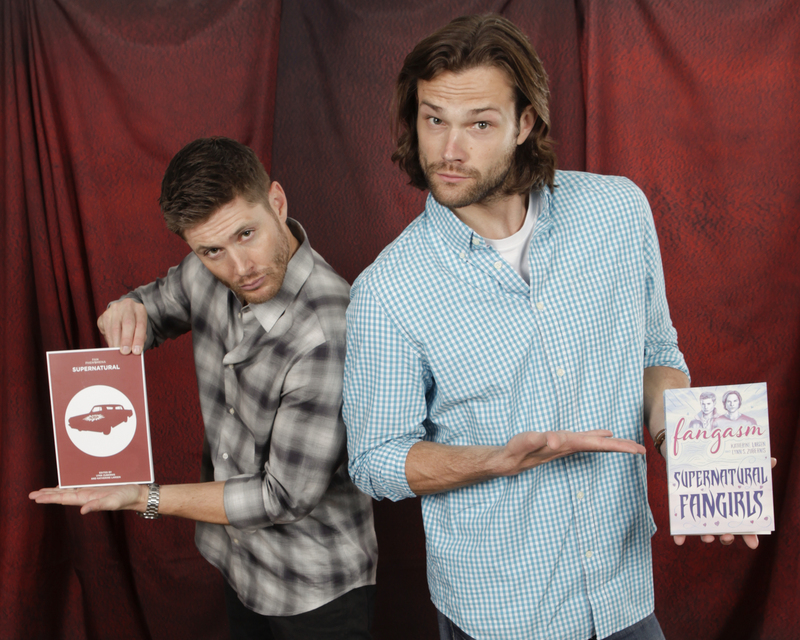 To celebrate the release of Fan Phenomena, we’re giving away signed copies of our books — autographed by Jensen Ackles, Jared Padalecki, Misha Collins, Richard Speight Jr. and lots more of your favorite Supernatural actors. You can enter by scanning your badge at the Cinequest booth. Come by and say hi, and if you like, we’d be honored to sign your copy of Fangasm or Fan Phenomena. This has been a wild ride for us, and it seems fitting to come back to Comic Con to release the newest book. 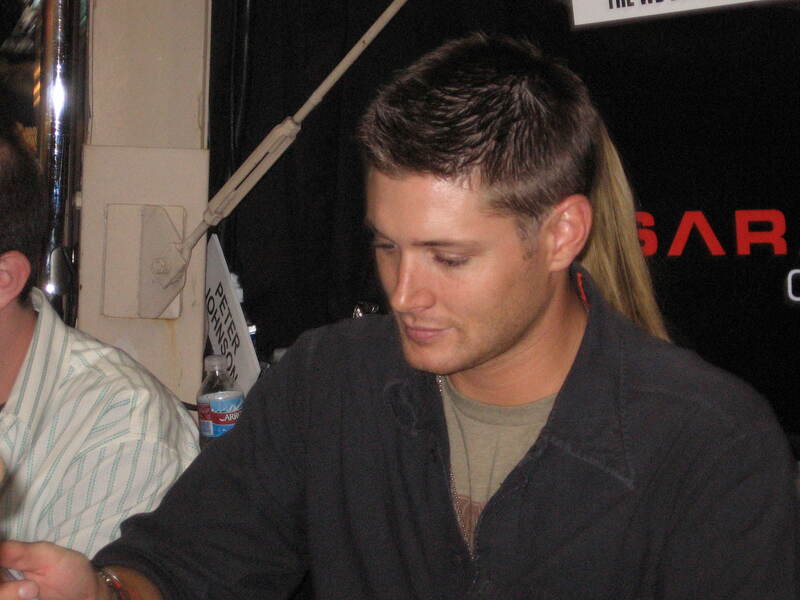 It seems like yesterday when we first met Jensen (and Lynn hyperventilated for the rest of the day). Jensen apparently was not quite as affected, as you can see. 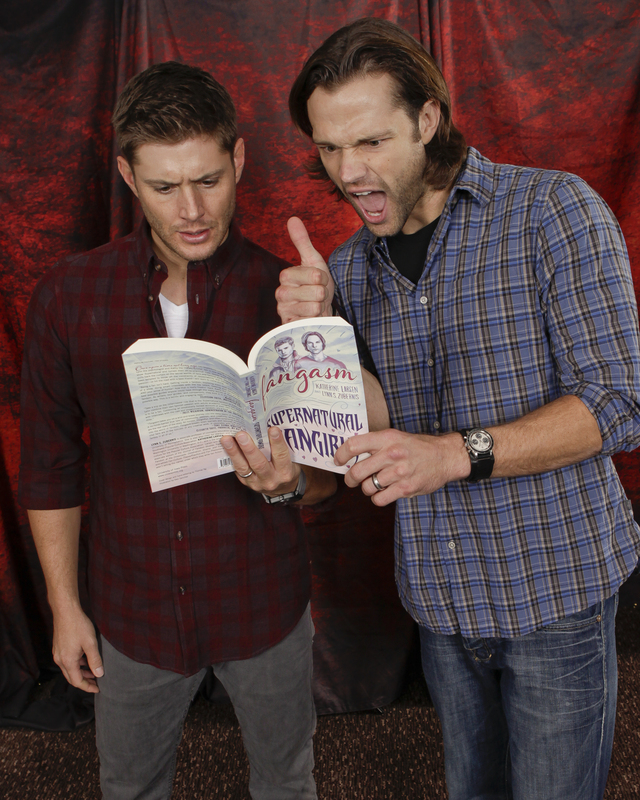 When we wrote Fandom At The Crossroads and Fangasm, we never in our wildest dreams thought that the Supernatural cast and crew would be so supportive, or that they’d actually read the books. 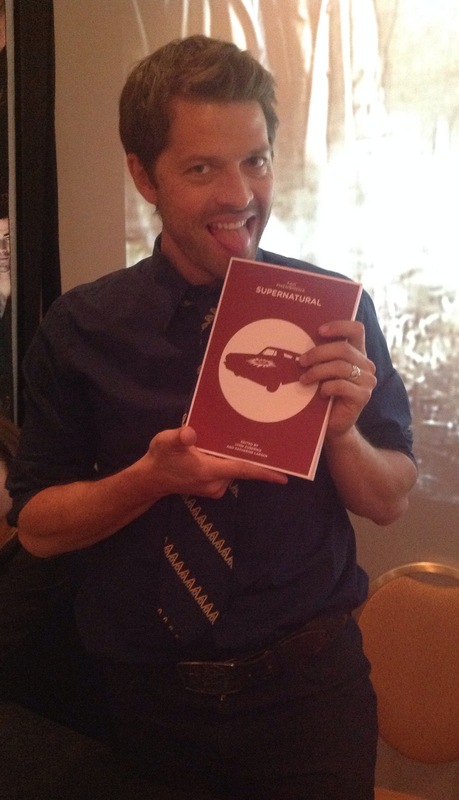 We certainly never expected that Misha and Richard would actually write chapters for one! 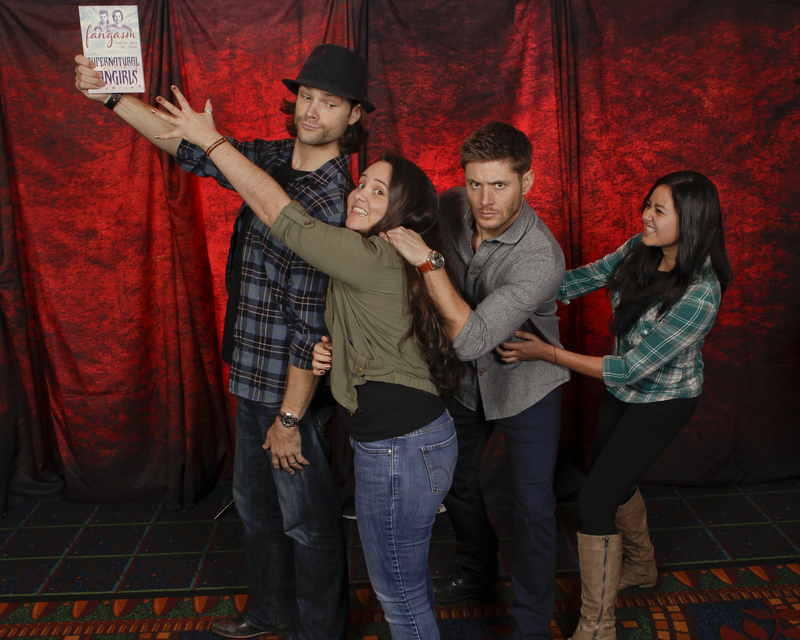 Jared told us the books helped him understand fandom and appreciate fans even more (yes, we cried – who wouldn’t have?) That it was amazing that fans are able to go out and express ourselves, and that he hopes we know how amazing this is and that we continue to maintain the fannish culture. Fandom is the place that we can be ourselves, he said, and we shouldn’t let anyone tell us otherwise. SPN fandom can be contentious and argumentative in our passion for what we love, but more often it’s supportive and validating and full of the most awesome people we’ve ever met. Last week I watched fandom come together to raise money for a fan who was down on her luck, with an impromptu fan auction taking off and being a wild success. We were honored to take part. A few months ago, Kim Rhodes told us how blown away she was by the response to a plea for support for her daughter’s school. Misha wrote in his chapter of Fan Phenomena: Supernatural about the amazing potential of the SPN Family and what we can accomplish when we put our minds to it. @MiniKateMinion: reading fangasm for the 2nd time and I love it, it makes me feel better as a fan, makes me feel normal and not a freak! @AngieHamilton63: I say this all the time but this book changed my life and validated me as a fangirl! @L3naP_SPN: page 215 jared’s interview. don’t know how u guys didn’t lose control,but I wouldve needed a seizure shot to get me to refocus. Our new book, Fan Phenomena: Supernatural, is a celebration of Supernatural and the SPN Family — it has chapters written by fans, by academics, and by Supernatural cast and crew, including Richard Speight Jr. and Misha Collins. 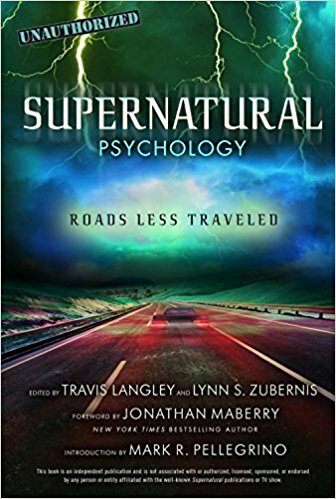 We’ve all had our lives changed by this amazing Show, and each writer expresses just how Supernatural impacted them and why it has inspired so many of us. Richard Speight, Jr. shares his perspective on Supernatural conventions, with as much zinging wit as you’d expect from the guy who played The Trickster and Gabriel. Serge Ladouceur, Supernatural‘s incredibly talented cinematographer, brings us the behind the scenes process that goes into making the Show so darkly beautiful. Vidder ash48 talks about the creative process of making fan vids. Superwiki admin Jules Wilkinson, aka missyjack, shares the evolution of the indispensable SuperWiki. Mary Dominiak, aka Bardicvoice, writes about the SPN Family. 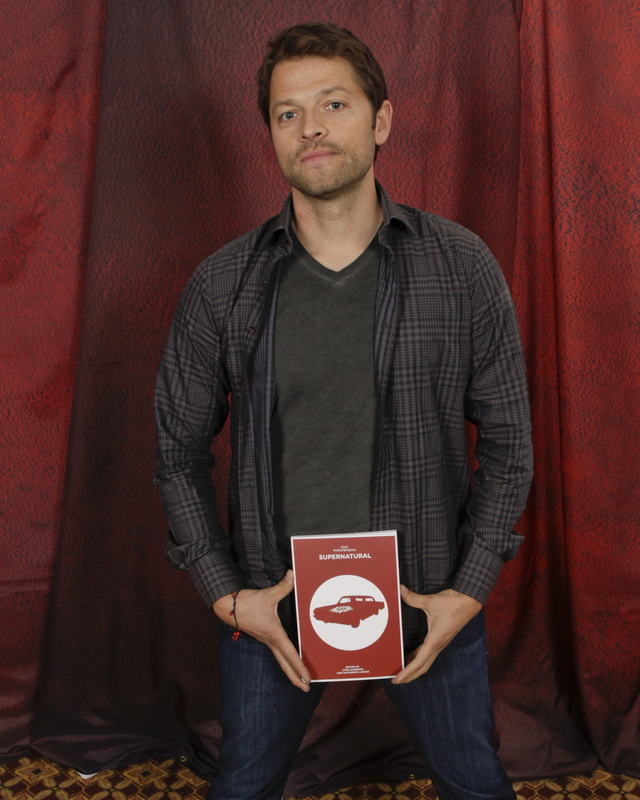 Misha Collins writes a chapter about discovering fandom and how that discovery changed his life — for the better (with just as much irreverence as you’d expect, thankfully). So who’s coming to Comic Con? If you’ll be there, come by the Cinequest booth to say hi or to check out our books and the awesome fannish stuff that Cinequest carries. If you’re not going to Comic Con, you can order any of our books from the links at the top of this page. And follow us on twitter @FangasmSPN for live tweets from Comic Con, and on Facebook and Tumblr too! Hmmmm. It looks like I might have some traveling companions. The boys have staked out my suitcase and are refusing to move until I accede to their demands. Can’t really blame them though. I mean, it’s Comic Con! So are we 🙂 Yay! My life changed for the better when I experienced my first Supernatural con in Toronto. I could be me and not have to hide my geek side. I’ve lived out loud since! Your book has resonated with me and I’m only at the third chapter! Thank you. I look forward to reading the second book and only regret I can’t win a signed copy like the lucky bunch going to San Diego ComicCon. I envy your discussions with cast and crew. I would love the opportunity to pick their brains about the who, what, how of the production of this amazing show. Once again, thanks for having given the fandom such an intelligent voice. Thank you so much – we LOVE hearing these wonderful stories and especially love knowing that Fangasm resonates with you. Live out loud! No shame! Oh how I wish I could be there! Oh how I look forward to your tweets! I bought both your most recent books and have read and re-read them — being new to this fandom, I got so much out of these books and SuperWiki and am already publishing my own fanfiction and having a blast! Thank you for helping me find my way in the amazing world of SPN fandom!! I woulf love Supernatural everything. Especially the Impala! Meanwhile, I’ve finished reading ‘SPN Fangasm’ for the second time (it was a Christmas gift), because after getting my copy of ‘Fan Phenomena SPN’ two months ago, I felt the need to re-read your first HOTTIE book again. So, a big THANK YOU to both of you lovely ladies, for giving us those hottielicious books. ‘Fangasm’, primarily, showed me that we’re not just a bunch of lunatic women and that there’s absolutely no reason for us to feel guilty about our ways of fangirling. 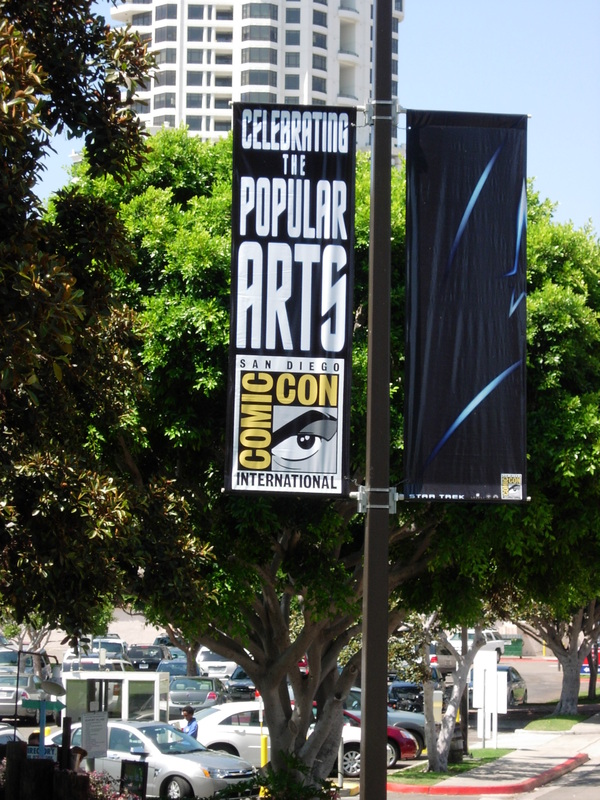 Oopsie… I almost forgot: enjoy your trip to Comic Con, dears; in my mind’s eye I’m with you. I haven’t read the earlier books YET but love Family Don’t End With Blood. I’m a new fan but latched on during a personal difficult period to the series and the messages of hope and psychologically deep truths that appear so regularly in the relationships and self examination of the characters… Thanks for looking deeply at SPN. So glad you discovered Supernatural and that Family Don’t End With Blood resonated with you – welcome to the #SPNFamily!